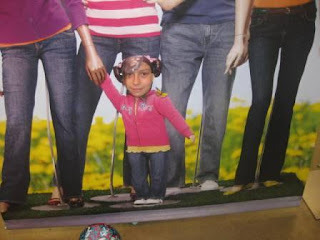 She just HAD to get in there and get her photo taken while we were at Old Navy last week! too fun - my daughter (and she's 13!) always has to sit on the bench with the little dog in ours and press the button to make him bark! At first glance that creeped me out. LOL But now that I realize what the picture was ... lol it's cute :) I wonder if there's one at our Old Navy, I haven't been in a long time! I am not real sure what is going on there, LOL, but it's a neat photo. I am guessing you put the face of someone on there somehow? I feel like I am missing something. LOL. Ah well. Speaking of Old Navy I have to tell you of a hair-pulling experience over the weekend while they were selling flip flops for $1 per pair. OMG... we went shopping on Saturday afternoon and the store in Sandusky, OH was ripped apart. Clothes and shoes all over the floor, associates running around ragged dealing with customers, and the line to checkout was all the way to the back of the store, about a 45 minute wait, is what I heard from a lady I ran into at Target, after deciding it just wasn't worth the frustration. Nice pic by the way. That shot is just hilarious! Happy WW. lol that is too funny!